Saturday morning in Otsego County, October 25, 2014, was cold with frost on the ground . 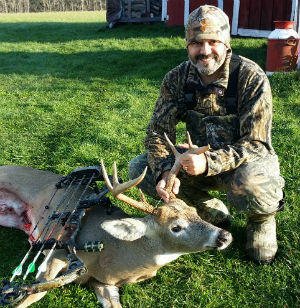 I was nestled in one of my double ladder stands situated on a travel corridor / transition area for deer feeding off my plots in the morning and going to bed high on the ridge or in an area I created as a sanctuary . The treestand is surrounded on three sides by old growth pine trees and apple trees out in front. To the right of me is a mock scrape I open up each year and was hoping to get a shot at a big ten pointer I had on camera. To my surprise this big 8-pointer showed up to check the scrape and walked out in front me at about 20 yards. I drilled him right through the heart. He ran only 40 yards and dropped. This buck and I have a little history. Two years ago I had him on my trail camera. However, ther were no sightings of him during the season. Then in the late season he started showing up on camera again so I was hopeful to maybe take him in the late regular season or muzzleloader. 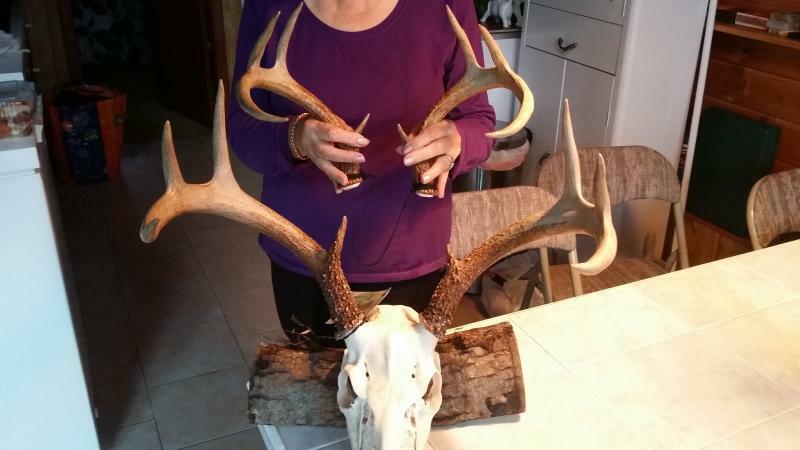 Little did I know, when I got back from an evenings hunt in early December my father told me he found a set of horns neatly laying under an apple tree. I was upset to say the least, but going through my mind I knew something was wrong as he shed his antlers way early. Fast forward two years and now that he was down I could see why he dropped early two years prior. He had a deformed front hoof from either birth, or most likely, an injury. 2Based on the shed my Dad found two years ago I put him at 3 1/2 years old then. 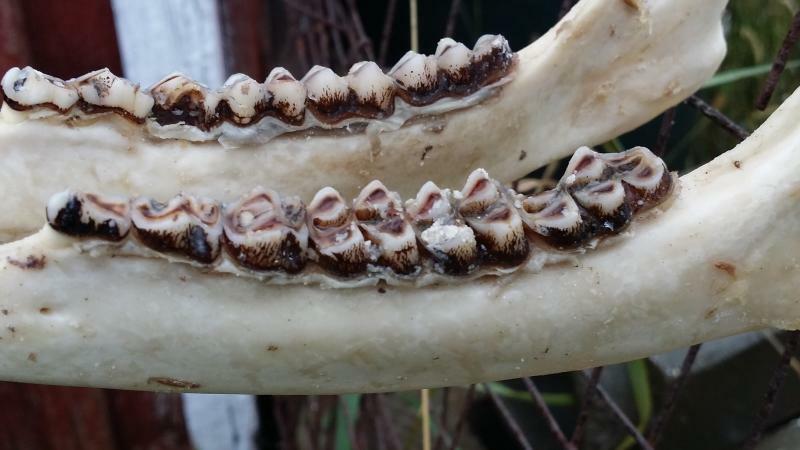 Im no expert on how to age deer by teeth, but based upon his history and having hunted this area for many years im thinking was 4 1/2 or 5 1/2.